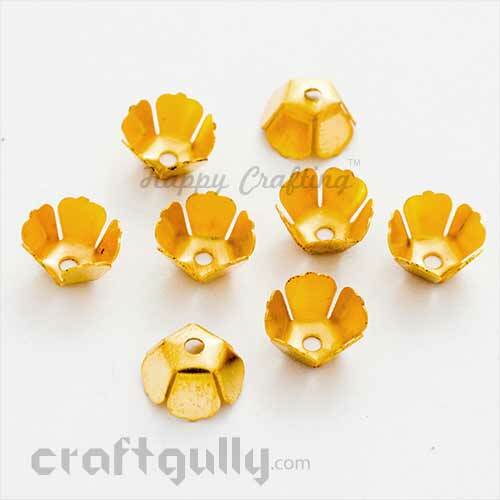 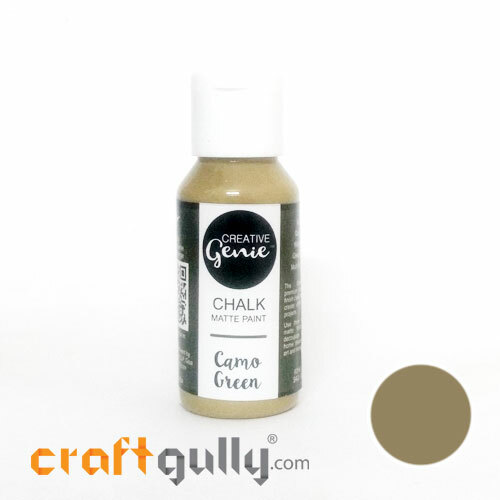 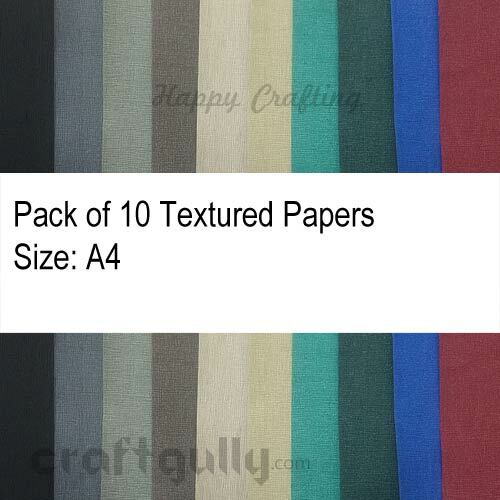 "Iam very much happy with craftgully as a craft lover. 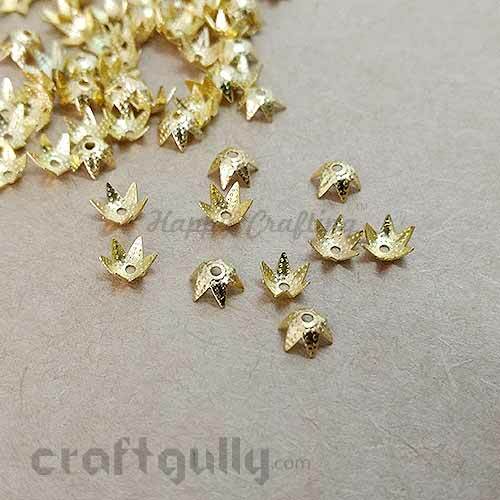 The most impressive thing is all the items are delivered at a time rather than one at a time in case of di.."
"Loved the products. 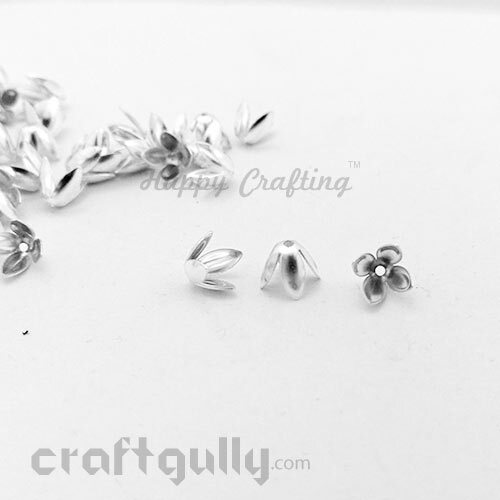 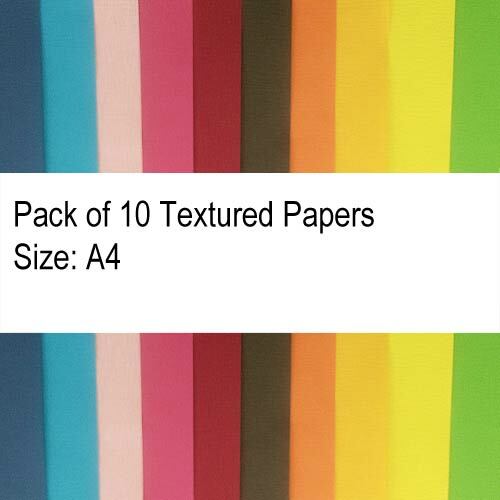 Also impressed by how quick the delivery was :).."
"All products are very good and quality is good. 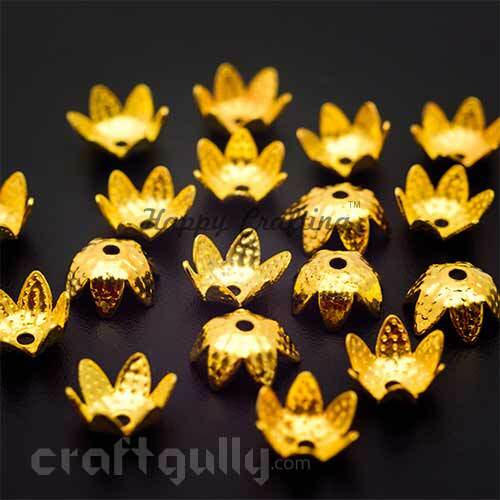 Thank you .."
"Today i received my parcel and the products are very cute,affordable and as per the site u show. 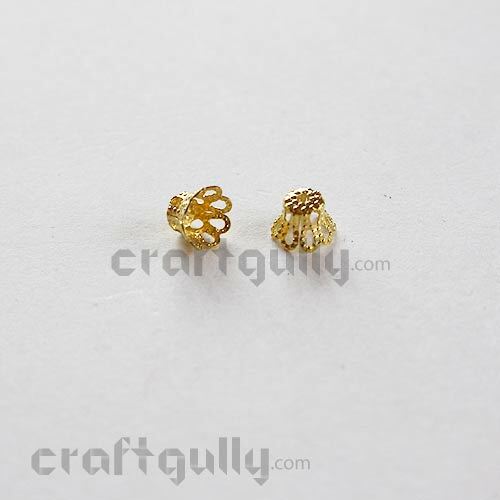 Thank you .."
"Received my courier yesterday only.Packing of all products was excellent ..."
"Thnku it was a great experience shopping with you On time delivery and exact product as shown in picture.."
Let your jewellery pieces stand apart with these gorgeous bead caps! 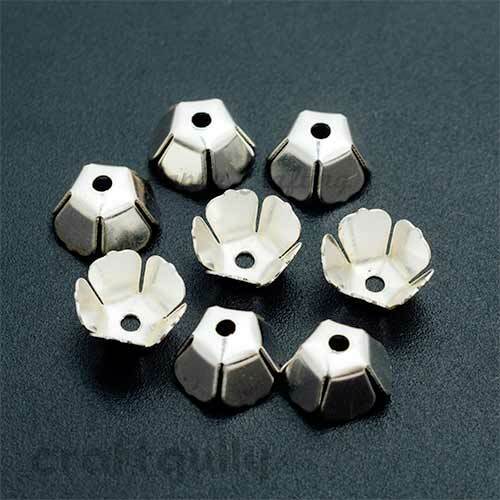 Match them up with a combination of seed beads and large beads for something that's a little off beat.Size: Approx 15 x 9mmQuantity: 6 bead caps in a pack Color: Silver finish Material: Metal True colors may vary slightly from what you see on your screen.. 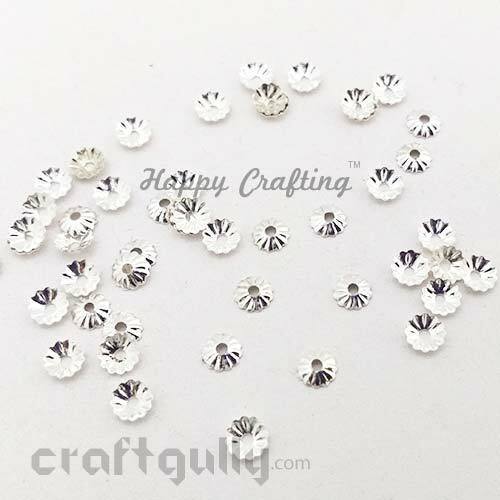 Size: Approx 5 x 2mmQuantity: 50 bead caps in a packColor: White silver finishMaterial: Metal True colors may vary slightly from what you see on your screen..
Width: Approx 6mm Height: Approx 2mm Hole Width: Approx 1mm Quantity: 50 bead caps in a pack Color: Silver finish (these are not made of silver) Material: Metal Color may vary slightly from what you see on your screen..
Fun little pointy additions for funky young jewellery! 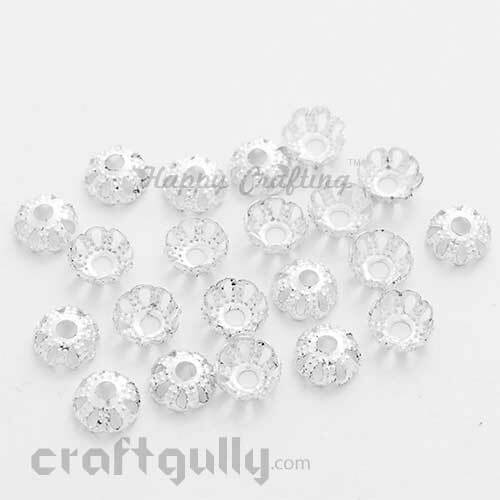 Size: Approx 6 x 2mmQuantity: 50 bead caps in a pack Color: White silver finish Material: Metal True colors may vary slightly from what you see on your screen..
Width: Approx 6mm Height: Approx 5mm Hole Width: Approx 1mm Quantity: 20 bead caps in a pack Color: Golden finish Material: Metal Color may vary slightly from what you see on your screen..
Width: Approx 6mm Height: Approx 5mm Hole Width: Approx 1mm Quantity: 20 bead caps in a pack Color: Silver finish (these are not made of silver) Material: Metal Color may vary slightly from what you see on your screen..
Gorgeous bead caps with small little florets to add a delicate layer of design to your jewellery pieces in just the right proportion!Size: Approx 6x 3mmQuantity: 50 bead caps in a pack Color: Golden finish Material: Metal True colors may vary slightly from what you see on your screen..
Gorgeous bead caps with small little florets to add a delicate layer of design to your jewellery pieces in just the right proportion!Size: Approx 6x 3mmQuantity: 50 bead caps in a pack Color: Silver finish Material: Metal True colors may vary slightly from what you see on your screen..
Width: Approx 6mm Height: Approx 1.5mm Hole Width: Approx 1mm Quantity: 50 bead caps in a pack Color: Golden finish (these are not made of gold) Material: Metal Color may vary slightly from what you see on your screen..
Width: Approx 6mm Height: Approx 1.5mm Hole Width: Approx 1mm Quantity: 50 bead caps in a pack Color: Silver finish (these are not made of silver) Material: Metal Color may vary slightly from what you see on your screen.. 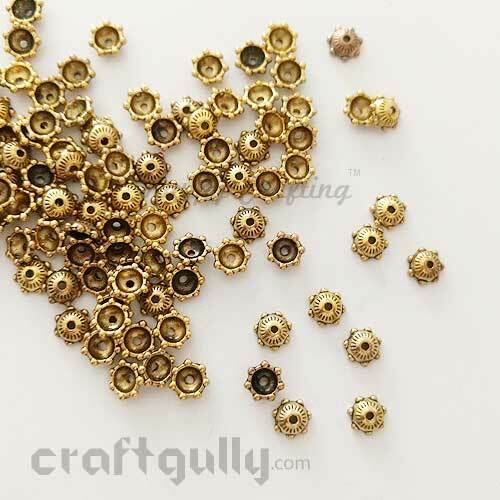 Size: Approx 6mm x 2mmHole Diameter: Approx 1mmMaterial: German Silver with platingQuantity: 10 bead caps in a packColor: Antique Golden**True color/s may vary slightly from what you see on your screen.. 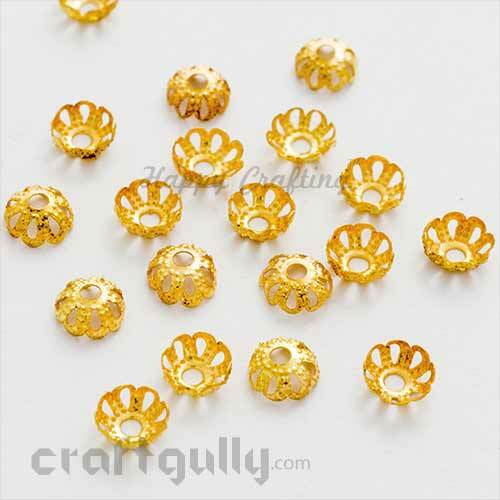 Size: Approx 6mm x 2mmQuantity: 50 bead caps in a packColor: Golden finishMaterial: Metal True colors may vary slightly from what you see on your screen..
Width: Approx 7mm Height: Approx 3mm Hole Width: Approx 1mm Quantity: 50 bead caps in a pack Color: Golden finish (these are not made of gold) Material: Metal Color may vary slightly from what you see on your screen..
Width: Approx 7mm Height: Approx 3mm Hole Width: Approx 1mm Quantity: 50 bead caps in a pack Color: Silver finish (these are not made of silver) Material: Metal Color may vary slightly from what you see on your screen.. 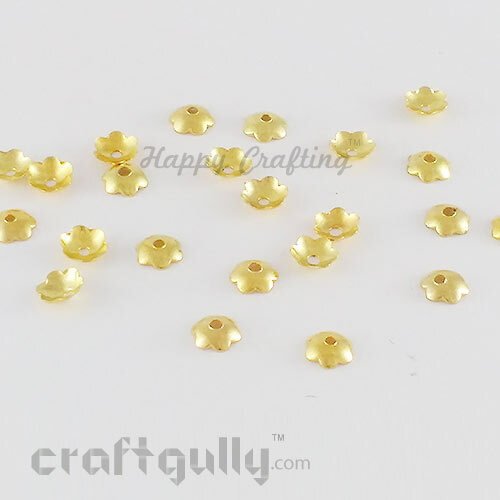 Size: Approx 7 x 6mmQuantity: 12 bead caps in a packColor: Golden finishMaterial: Metal True colors may vary slightly from what you see on your screen.. 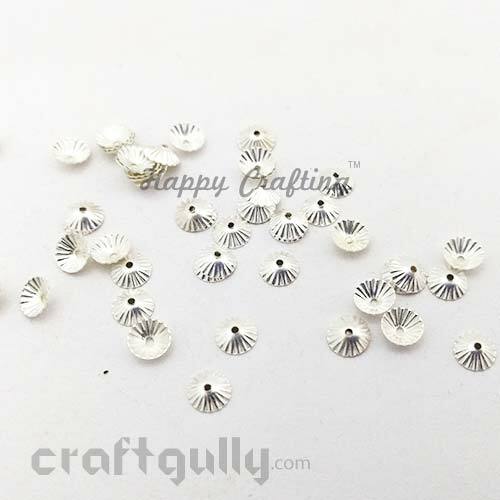 Size: Approx 7 x 6mmQuantity: 12 bead caps in a packColor: Silver finishMaterial: Metal True colors may vary slightly from what you see on your screen..
Light weight with a self-pattern, these acrylic bead caps add that much needed jazz and are a must have for handmade jewellery projects. 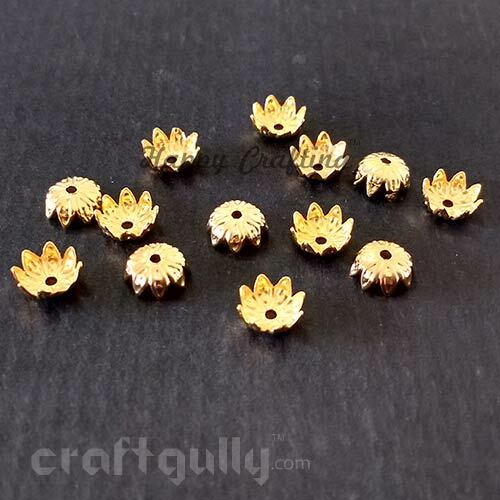 Size: Approx 8mm x 5mmHole Diameter: Approx 1mm Quantity: Pack of 12 bead caps Color: Rose Gold Finish* Material: Acrylic *True color/s may vary slightly from what you see on your screen..
Sharp floral shape lines make this bead cap a must for smooth round beads! 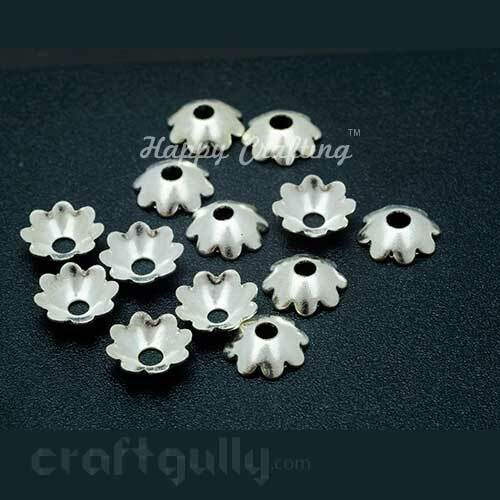 The ultimate opposites that definitely attract and make a great combination.Size: Approx 8 x 4mmQuantity: 15 bead caps in a pack Color: Golden finish Material: Metal True colors may vary slightly from what you see on your screen..
Sharp floral shape lines make this bead cap a must for smooth round beads! 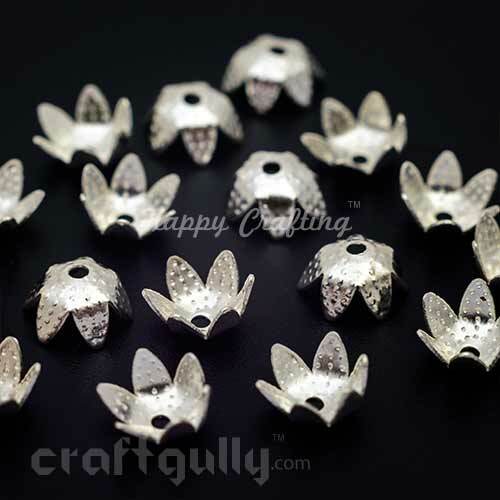 The ultimate opposites that definitely attract and make a great combination.Size: Approx 8 x 4mmQuantity: 15 bead caps in a pack Color: Silver finish Material: Metal True colors may vary slightly from what you see on your screen..